Re-designed 'Strait Power' Water Turbine Inspired By Earth's Laziest Predator | OhGizmo! 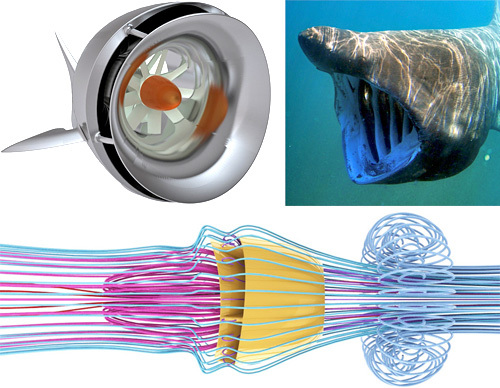 In a new and never-to-be-continued column I like to call ‘totally ripping off nature’, industrial designer Anthony Reale has designed a new kind of water turbine called the ‘Strait Power’ which was inspired by our planet’s laziest predator, the Basking Shark. The shark basically spends a good 18 hours a day drifting through the waters with its mouth wide open, filter feeding on zooplankton. But it turns out that thanks to a clever design the Basking Shark creates a pressure differential as it moves through the water which helps to automatically draw water through its gills, instead of actively having to pump water through its system. Observing this phenomenon Anthony designed the Strait Power turbine which uses a double opening that draws water in and then compresses it to create a “low-pressure zone” which draws it past the turbine blades with more efficiency, generating more energy. In fact after undergoing a rigorous 200 hour test at the University of Michigan’s Marine Hydrodynamics Laboratory (Go Blue!) the Strait Power turbine was found to improve the power output of a regular turbine by about 40%, and that was just the original prototype. Anthony intends to improve and advance the design and has already come up with several possible applications ranging from industrial uses to the military.